2019 Surtees/Yamaha Grand Prize now a ‘Quarter-Million’ package! The most valuable “must-be-won” Grand Prize in history just got even better — and is now worth more than a quarter of a million dollars! The now-$250,000-plus Surtees/Yamaha Grand Prize will be given away at this year’s Hutchwilco New Zealand Boat Show, at the ASB Showgrounds on May 16-19. All those buying tickets to the show, either at the gate or online, will be eligible to enter the Grand Prize draw, with those buying their tickets online getting a second, bonus entry, too! The prize package, which features a Surtees 750 Open Cabin Game Fisher, twin Yamaha 150hp 4-stroke outboards and the revolutionary new Yamaha Helm Master boat control system, has now been enhanced with the addition of a $18,500 Hosking Trailers custom tandem braked trailer, a $17,000 Garmin electronics package, a $7500 Balex Auto Boat Loader and a $4000-plus Lone Star GX3 drum winch package. The Hosking Custom Tandem Trailer has been specially designed and built for the Surtees/Yamaha Grand Prize and will come complete with a Trailparts Credo multi-volt, wireless brake controller. This will allow the lucky Grand Prize winner to simply “plug in and go”, using any vehicle with a 3500kg towing capacity to tow their Grand Prize without the having to install a hard-wired brake controller. The custom Hosking trailer, worth around $18,500, will also feature multi-rollers, a self-centring roller combination and a 15:1 NZ-made winch. Rated to 3500kg, the maximum for a light trailer on New Zealand roads, it will come complete with Treadway light commercial tyres and fantastic-looking alloy rims. The Hosking Custom Tandem Trailer will also be fitted with a Balex Auto Boat Loader, worth an additional $7500, to make launching and retrieving a breeze, even when singlehanded in unpleasant conditions. 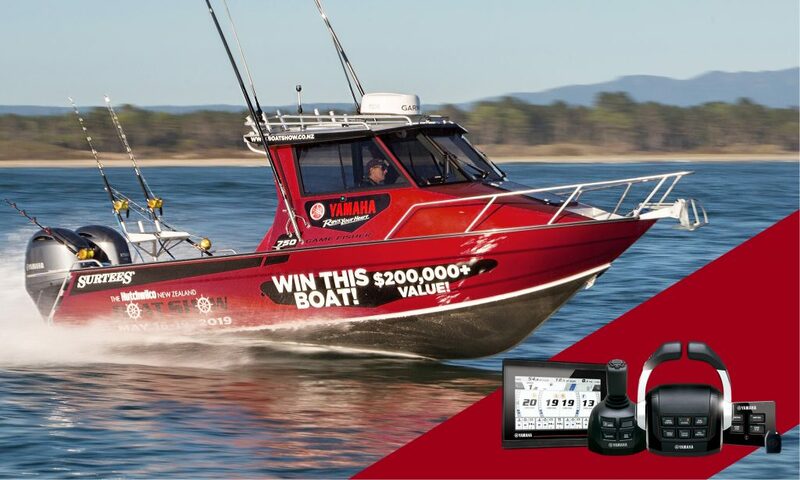 Helping the Surtees/Yamaha Grand Prize winner safely navigate to their favourite fishing and cruising grounds — and giving them the best possible chance of catching fish once there — is a very impressive, top-of-the-line, Garmin electronics package. Valued at over $17,000, it includes Garmin’s super-simple to use, intuitive, large twin 12in GPSMap 7412xsv J1939 multi-function displays with GPS and chart-plotter. There is also a Garmin GMR24 high definition radar with a 48 nautical mile range featuring bird mode and a chart overlay function to make it easier to quickly identify objects, both on shore and at sea, at night. The Garmin dual CHIRP sonar and 1kW transom mount will quickly pick out fish in both shallow inshore waters and in depths up to 600m. It will also enable the Grand Prize winner to see the seafloor at up to 800m. The Garmin VHF 115i marine radio is a powerful 25W unit capable of communicating “over the horizon”. A commercial grade unit, it is also super tough and includes DSC for even greater safety. A chart card and all the necessary cables, NMEA2000 starter kit and connections are also included. To ensure safe, effortless anchoring, the Quarter-Million Dollar Surtees/Yamaha Grand Prize will also include a Lone Star GX3 Drum Winch package, including rope and chain. A mid sized drum anchor winch worth over $4000, the GX3 features an oversized 1500w motor, gearbox and large drum capacity. Like all GX Series winches it also features the world’s first IP68-certified motor, Italian-made transmission, emergency manual release and stainless steel machined and anodised aluminium construction. Rounding out the prize package is a latest model Fusion Apollo stereo, a comprehensive Hella LED lighting package, Seadeck flooring throughout, Oceanblue outriggers, HiTech Plastic seating and a Go Pro package with professionally-positioned mounts. A full set of Hutchwilco inflatable lifejackets and a year’s Yamaha Marine Insurance are also included. The 2019 Hutchwilco New Zealand Boat Show will be held at the ASB Showgrounds in Greenlane, Auckland on May 16-19. Tickets to the show are just $20 each and are now available on-line at www.boatshow.co.nz. All tickets bought online earn a bonus entry into the Surtees/Yamaha Grand Prize draw and are also automatically entered into the draw for a powered Viking Kayaks’ Reload package worth over $8000. Full details about the amazing Quarter Million Dollar Surtees/Yamaha Grand Prize package, along with all the terms and conditions, are now available on the show’s popular website: www.boatshow.co.nz. Admission: Adults: $20; children 16 & under FREE. Straight out of the paint shop: the Grand Prize Surtees 750 Game Fisher in its striking Prowler Red livery.